Bus Route 8 is one of two routes between Hamilton and Royal Naval Dockyard (Kings Wharf/Heritage Wharf). The other is Route 7. For the first half of the journey, buses on Route 7 takes a picturesque route along the South Road while those on Route 8 travel along Middle Road. From Southampton Parish to Dockyard, both routes are the same. 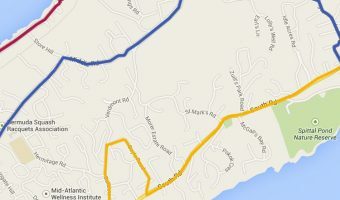 If you’re just travelling between Hamilton and Dockyard, take Route 7. The views are much prettier. Buses on this route leave the Central Terminal in Hamilton and then travel out of the city on East Broadway, passing the Bermuda Underwater Exploration Institute. They then head south into Paget Parish and travel along Middle Road. Destinations on Middle Road include Paget Marsh, Newstead Belmont Hills, the Belmont Hills Golf Club, Warwick Pond, Riddell’s Bay Golf & Country Club, the Fairmont Southampton (Middle Road entrance), the Port Royal Golf Course, Pompano Beach Club, Hog Bay Park, and Somerset Bridge. After crossing Somerset Bridge, the route goes north through Sandys Parish, passing Fort Scaur and then into Somerset Village (for Cambridge Beaches and Somerset Long Bay). From Somerset Village it’s just a 10 minute journey to Royal Naval Dockyard. The full trip from Hamilton to Dockyard takes approximately one hour. Buses run approximately every 15 minutes with services from Hamilton commencing at 6.45 am. Some buses on this route only go as far as Barnes Corner in Southampton. Check on the front of the bus or on the official timetable before you board. The map below shows the route taken by buses on Route 1. Click here for an interactive map showing points of interest and more.